This weekend saw the CollectConnect group of artists release copies of their ‘Freedbook’ into the wilds of London’s station book swaps. Books for London campaign founder Chris Gilson rode with the collective and looks back on the day. When you’re planning any activity that involves a good deal of travelling in London it’s fairly certain that it’s going to rain. This was definitely the case this Saturday when a group of intrepid artists and me assembled for the Freedbook crawl. FreedBook is a 72 page softback book, containing 68 one-page stories from 50+ artists. There were 100 copies printed in the First Edition. Each book is individually numbered, and each is signed by at least one of the artists. Starting at 10am at Acton Central, we would tour across as many of London’s station book swaps as we could, hopefully ending up at Raynes Park a little after 4pm. Braving the rain, I arrived at Acton Town slightly late but rendezvoused with Alban Low and the CollectConnect artists, some of which came all the way from Brighton and Swansea! After signing the first FreedBook and giving it a pride of place on local community organiser Sara Nathan’s book swap shelf, we were off to West Ealing. After some slight confusion about bus routes we made it to West Ealing in time to drop off our second FreedBook at what was a very packed book swap shelf. Hopefully the book found a good home quickly! Then it was back into town to head east to Charlton, where another FreedBook was released. The group was especially impressed with the quality of shelves at Charlton Station – a good example to shoot for with new shelves in stations in London! Heading back westwards back to London Bridge, the group struck out for Couldson South. However, on arrival the book swap shelf that had been there only 18 months or so previously was no longer to be seen – possibly the casualty of a recent station refurbishment. All was not lost, however, and a book was released in the waiting area. From Couldson South it was a dash towards Wimbledon via train and tram. Against all expectations, the group had defied the rain and kept to time, arriving at Wimbledon exactly as scheduled, in time to release a FreedBook in the waiting room on Platform 5. Alas the waiting room was rather empty of books when we went through, showing that the scheme there definitely has a good rate of take up! After a few minutes in Wimbledon, it was then a quick hop by train to our final stop of the day, Raynes Park. Arriving there, we met with Chris Larkman, who has been maintaining the scheme since 2005, and was the inspiration for the Wimbledon swap, which in turn was what inspired the whole Books for London campaign. Having corresponded with Chris several times via email, it was great to finally meet him and talk about the fun and frustrations of running a station book swap. 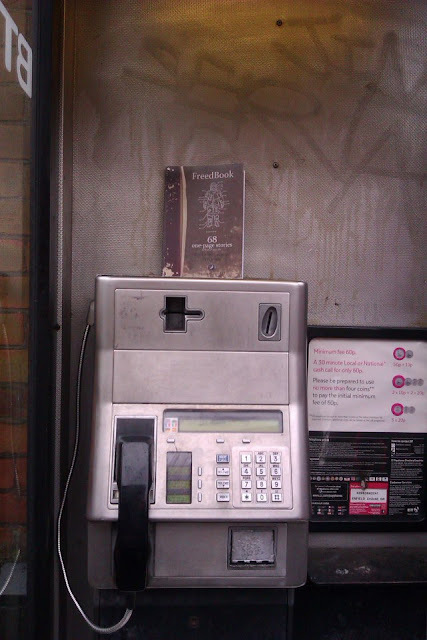 Chris signed our final FreedBook, and we released it onto the swap shelf at Raynes Park. More than six hours, and untold miles after we began, we had finished our FreedBook crawl. We all said our goodbyes, and I made for West London. There was one final surprise in store, though. Passing through Kingston, we made the great discovery of another book swap scheme! We’d run out of FreedBooks by this point, but I’d say Kingston will definitely be on the list for next time! We’d love to hear where the FreedBooks end up, so if you find one, let us know! CollectConnect have also written about the FreedBook crawl – read their article here. « Join us for the FreedBook London-wide release book crawl on 24 November!